Plettenberg Bay - ‘Plett’ to the locals - is a chic resort set on a dreamy arc of golden sand with a backdrop of densely forested mountains. Originally known as Baia Formasa (Beautiful Bay) by the Portuguese who landed here, the curve of pristine beach is now a trendy playground for sunbathers, surfers and wildlife lovers. 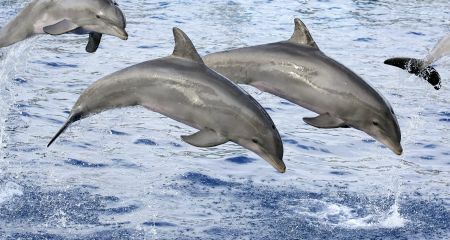 With dolphins leaping in the waves and whales patrolling the waters, Plettenberg Bay is a cosmopolitan coastal paradise that will add a splash of Garden Route glitz to your South Africa holiday. The sun-bleached sandy beaches of Plettenberg Bay stretch as far as the eye can see, flanked by lapping waves and frothing surf. There are 4 main beaches to choose from, all amongst the top sunspots along the Garden Route, so you’ll be completely spoiled for choice. What’s more, each beach has a distinct character all of its own. This makes Plett the perfect place to spend a few hard-earned and well-deserved lazy days looking out over the ocean. Central Beach is generally the busiest in Plett because it’s brilliant for sunbathing and it’s the pick-up point for whale watching cruises in the bay. It’s also popular with windsurfers and hobie cat enthusiasts, so the beach is always a-buzz. Lookout Beach is a surfer’s wonderland and offers incredible views of the nearby Outeniqua Mountain Range. It’s a hopelessly romantic spot to catch sunset with a cocktail. 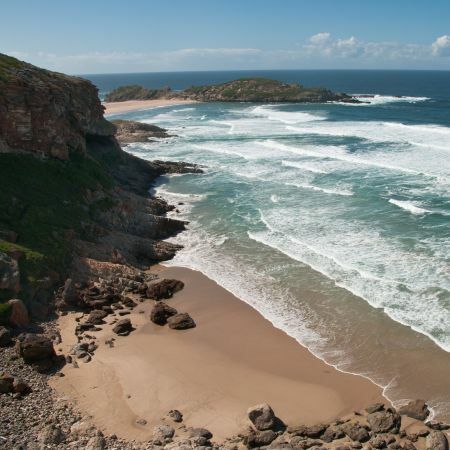 Robberg Beach is a real winner for spotting whales from the shoreline, making it wonderful for barefoot, sea-breezy walks. Keurbooms Beach is wilder and more natural, giving it an edge of untamed beauty. The small town of Plett itself has a generous handful of artisan craft shops, boutique galleries and small studios, so it’s a lovely place for sunny window-shopping and gift buying. You most certainly won’t go hungry in Plett, as there’s a huge variety of cafes and restaurants to try, ranging from beachside pubs to oceanfront bistros. And there’s far more to Plettenberg Bay than beautiful beaches and swanky bars. For one, there’s the marine wildlife. You can get a glimpse of Plett’s resident Bryde’s Whales all year round, and they are joined by their distant cousins, the Southern Right Whales from around June to November. Not only this, but they are joined by migratory Humpback Whales from the end of February, so the waters are positively awash with whales! Pods of Bottlenosed and Humpback dolphins weave in and out of the waves and there’s a breeding colony of Cape Fur Seals at the nearby Robberg Nature Reserve. Many tour agencies in Plett offer whale-watching cruises, so a trip is easy to book and if you’re after more outdoor adventures on water or on land you won’t have to look far. There’s a whole host of watersports on offer, including water-skiing, windsurfing, hobie cat sailing and canoeing. Avid and aspiring anglers can indulge in both salt and freshwater fishing. If you’re more of a land lover, the forests and mountains that rise up behind Plett are brilliant for mountain biking, horse riding and hiking, while there are a few great greens to occupy golfers. Alternatively, why not take to the clouds and try skydiving over the stunning Plettenberg Bay coastline? Or for a real adrenaline rush, abseil off the cliffs at Robberg Nature Reserve or The Crags near Plett. With all this and heaps more, there’s no chance of getting bored in Plettenberg Bay but every chance that you won’t want to leave. It’s not only one of the best spots to explore on the Garden Route, it’s a South Africa holiday must-see. In the extensive gardens surrounding the manor house, the 21 luxurious one-bedroom cottages and suites have been designed for absolute comfort and privacy. All have fireplaces, satellite TV, mini bar, bath and separate shower, and a veranda. Sixteen uniquely individual rooms offer uninterrupted views over the indigenous forests and Tsitsikamma Mountains. Each room has a private wooden deck, fitted with its own hammock and wooden furniture overlooking the forest and an en-suite bathroom with bath and shower. The 18 luxurious and stylish suites offer beautiful views of the lovely seaside town of Plettenberg and the pristine hotel pool. Guests can enjoy dining at the exclusive hotel restaurant, pampering at the spa center, relaxing drinks at the bar, and a dip in the pool to cool down. The luxury rooms and suites offer a truly idyllic and indulgent experience. Each room is exquisitely unique and all have undercarpet heating and air-conditioning. Elevated boardwalks high in the forest canopy allow easy access between the main lodge and the 10 exclusive and very private suites and the 6 luxury villas. Each suite, rising to heights exceeding 6 metres, is a harmonious combination of the craftsmanship of ancient times and the indulgent luxury of every modern convenience. The interior of the hotel has an afro-Colonial look which is very contemporary. All the luxurious rooms have extra long sleigh beds and TV, and the larger rooms have fireplaces and a CD player and mini bar.